The grip pulse sensor enables you to monitor your heart rate by placing your thumb on the hand grip, allowing you to keep within your target zone. 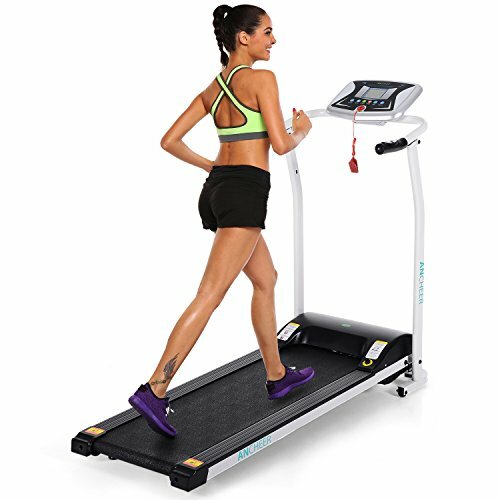 it will auto stop if you fall or drift back dangerously on the treadmill the auto stop function which minimizing the risk of injury. -Suitable for elderly: Walking on this treadmill after dinner. Send this treadmill to your grandma or grandpa must be the most comfortable choice. -Suitable for students: The perfect size makes it more spacious anywhere in the dormitory, Space saving design allow you to fold up when not in use. After studying, you can run 20 or 30 minutes to keep fit and enjoy mental and physical pleasure. -Suitable for commuters: You can walk slowly or run fast with adjustable speed. 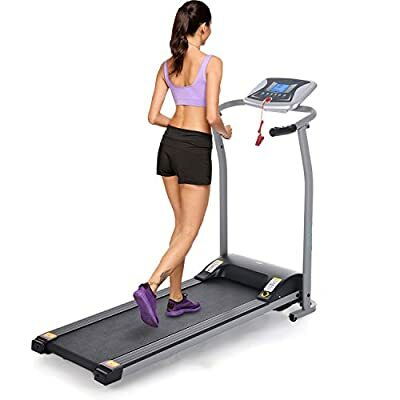 The treadmill can not only help you enhance physical fitness, but also can alleviate the pressure from work, ANCHEER S8400 is undoubtedly a good choice. -Suitable for housewives: Being able to exercise at home after hard day at housework and taking care of the kids without having to worry about left kids alone. [SPACE SAVER]: Free installation! Foldable treadmill for storage. Portable treadmill wheels for move. Put this folding treadmill anywhere you want, living room,bed room,corner, balcony, dormitory,etc. Perfect size for home , dormitory, office use. [ LCD WINDOW CONSOLE DISPLAYS]: The LCD window console display helps you keep track of a number of functions including time, distance,speed,calories and your heart rate. 12 training programmes available, you can vary your workout regime from burning fat right through to building stamina. [HEART RATE MONITOR]: Wireless pulse sensor monitors your heart rate to achieve optimal intensity levels by by simply placing your thumb on the pulse sensor of handrail. [EASY-SELF LUBRICATION]: Compared with traditional self-service refueling which need to lift the running belt and pour the lubricant on the running board, there is a quick service refuling button, just add lubricant on the hole and let the treadmill run itself at the maximum speed for some time. And it will dispense it automatically. [WARRANTY]: US STOCK,This electric treadmill had passed CE, ROHS,CB,EN957,IEC certifications by SGS. 2 Years for frame & 3 Years for motor & Friendly Customer Service.